The one-hour 4x6 jumbo print may be no more than a memory but that doesn't mean the screen has replaced the print. Screens are lovely, but the ones that are handy are too small and the ones that are big enough aren't portable. To really enjoy your photography, the answer is a big printer making big prints you can hang on a wall so you can look at them all the time. There have been a number of low-end 13x19-inch printers over the years, but low-end and high quality don't dance together. They've come and gone. Meanwhile quality has getting more affordable. Canon's Pro 9000 Mark II is our favorite dye-based ink printer and Epson's R2000 now competes with Canon's excellent Pro 9500 Mark II in the pigment division. 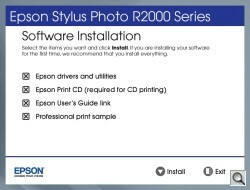 At $499.99 list and as low as $279.99 directly from the company, the Epson Stylus Photo R2000, which replaces the R1900, brings more than just 13x19-inch pigment printing to the party, adding CD, roll and fine art media, UltraChrome Hi-Gloss 2 inks and WiFi/USB/Ethernet connectivity. • Epson UltraChrome Hi-Gloss 2 pigment ink, which is "highly water, smudge and fade-resistant"
Maximum Printable Area: Maximum paper width 13"; Maximum cut-sheet size 13x19"; Maximum printable area 13x44"
Epson states the R2000 is compatible with Windows 7/Vista/XP/XP Pro x64 and Mac OS 10.5.8 to 10.6. 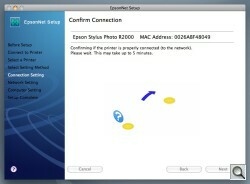 Epson told us the R2000 drivers "are Lion compatibile but some of the included software may not work in Lion." At first, we were not able to complete the installation process from either the included CD or a downloaded driver and utility package. In both cases, the Lion Print & Scan preference panel insisted the driver was available from Apple but, after looking for it, complained it was "currently unavailable." 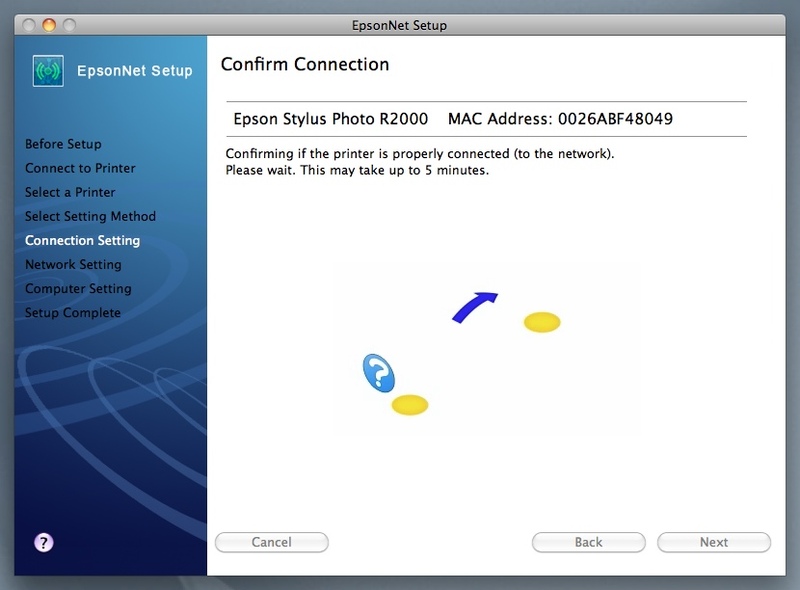 We tried a number of things to get around that, but none of them worked until we ran into a solution for the Epson 3880 posted by Phil Farmer on the Luminous Landscape forum. 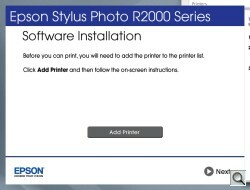 There are two files to download from the Epson support page for your printer (whether the 3880 or R2000). The first is the Printer Driver itself (v8.43 at the moment). The second (which is what eluded us) is the Common Updater. You must install the Printer Driver before running the Common Updater. 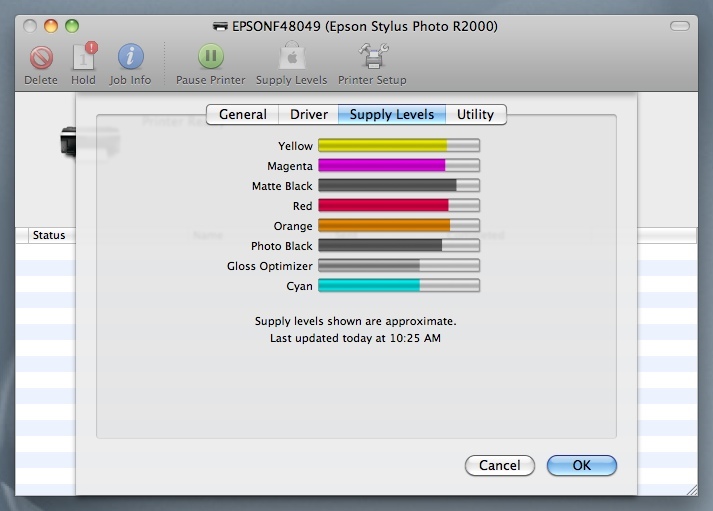 Epson does tell you this, but only under the Common Updater notes. Neither install actually provides any feedback. You click on the VISE installer, it runs in the background and silently quits. But don't worry, it did its job. Once you've installed both packages, you can go to the Lion Print & Scan System Preference and Add the printer. After we did that, we were able to print a scan (from our upcoming review of SilverFast 8) to the R2000 wirelessly from our Lion machine via Photoshop, with the R2000's print options all available as expected. 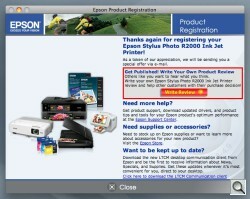 The latest drivers are available on the Epson site at http://www.epson.com/support/R2000. USB and Ethernet cables are not included. You'll need a USB cable to complete WiFi setup. The larger ink cartridges for the R2000 are all $21.99 direct from Epson. Amazon offers some of them at $19.95, a 9.0 percent savings, available via the Imaging Resource Amazon affiliate program (http://www.amazon.com/dp/B004ZOUR82/?tag=theimagingres-20 for example). Notch. The notch makes it easy to tear open the package and unwrap the cartridge. Tab. Pull the yellow tab on the bottom of the cartridge before installing. Photo Black ink is optimized for printing on glossy sheets (including glossy, luster, satin and semigloss finishes). Matte Black is designed for matte finishes and fine art media. Your usage of these two inks will depend on what paper you use. But even if you never use one type of paper, normal charging and flushing will consume the ink. Gloss Optimizer, like Photo Black, is designed for glossy sheets, providing a clear coating where ink is not laid that protects the image and provides a more uniform shine across the image. Ink Used. Initial ink use. Prints Made. Made these prints. Paper really runs the gamut. 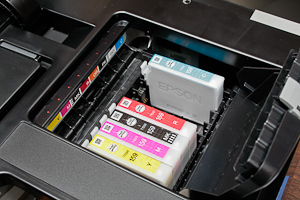 Epson supports a variety of sheets, sizes and finishes. 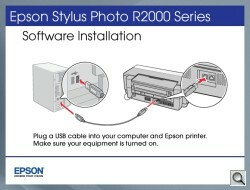 With the same inks on the same Epson papers as its predecessor, the Stylus Photo R1900, we assume the R2000 will deliver the same print permanence ratings from Wilhelm Research (http://www.wilhelm-research.com). In those ratings, Premium Glossy achieved over 100 years displayed under glass, over 120 framed with a UV filter and 52 years displayed without protection. Dark storage was over 300 years. Luster achieved 97 years under glass, over 115 years with a UV filter, 56 years unframed and over 200 years in dark storage. Velvet Fine Art achieved over 100 years under glass, over 150 years with a UV filter, 56 years unframed and over 300 years in dark storage. See the report (http://www.wilhelm-research.com/epson/R1900.html) for more information. The R2000 features a modern, asymmetrical design that gives the impression the box is leaning forward, anxious to get to work. The two-tone plastic cover has a band of piano black across the front where the buttons are located. Control Panel. LEDs signal status on several of them. Back. Four-inch roll mounted. USB, Ethernet ports. We found the buttons a bit less than responsive, so be firm. Small LEDs about several of them indicate status. There's also a WiFi status LED to the left of the row of buttons. Connections are on the back. The power cable with a two hole connector connects to the left and the USB and Ethernet connections are paired about two thirds across the bottom on the right. They are all easily accessible. On the front there's a PictBridge USB port in the lower left corner. The front output tray closes up into the face of the unit, attaching with two small magnets, and extends in three sections at a pronounced upward angle. The front manual feed tray above it opens to allow insertion of the CD tray. CD Tray. Separate tray just slips in the front. Printed CD. Sharp text, good color. Paper feeding is from the rear except for thick stock. The top panel door opens to provide a three-section support. Below it are guides to hook a single sheet feeder (for heavier fine art papers) and the roll paper holders (which are included in the package). Thick stock is fed through the front feed slot where the CD tray also is fed. To get inside the printer, you simply lift the large hood. Inside, the ink cartridges are parked to the right. The ink compartment itself has a cover. To access the compartment, you really do press the gray button on the cover toward the front of the printer until it unlatches. It doesn't seem natural, but it works. The control panel runs left to right on the piano black dashboard under the gray lip of the top hood. 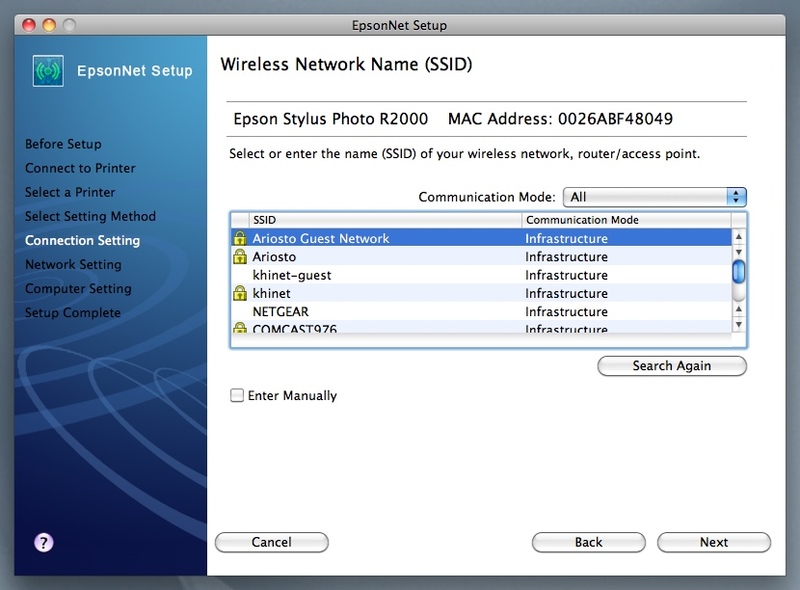 To the far left, a green WiFi status LED and Orange network status ID sit above WiFi and Ethernet logos. To the right of them is the Power button with a small green LED above it. Next is a WiFi button, a Network status sheet button, a Paper button with a very small Paper LED above it, an Ink button with another very small LED above it and, finally, a Roll paper button. There is no card reader and no LCD, as is typical of this class of printer. Our R2000 retail shipping box arrived with a poorly taped bottom. The two flaps were secured to each other but they were not secured to the side. So the bottom sagged. Open Me First. Can't go wrong. That isn't normally an issue because the Styrofoam inserts on the sides tend to hold the printer when you grab the hand holds cut into the box. But not in this case. The inserts are only half inserts. So the bottom can, indeed, fall out. Check it when you pick up the box. 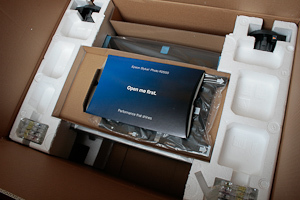 When we opened the top flaps, we were greeted by a small cardboard envelope that made it clear that's where to start. And indeed the installation poster, basic guide and CD were all inside. We were delighted to find roll paper ends and a CD tray among the included accessories, even though there is no USB cable. Don't forget to retrieve the power cord in the bottom corner of the box after you lift out the printer. Tape. Lots of parts, lots of tape. The printer can be excavated by removing the top two Styrofoam inserts and grabbing the handles of the plastic bag that contains the printer. 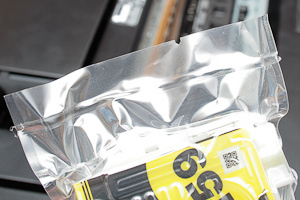 If you print infrequently, keep the plastic bag handy. It makes a nice cover that helps prevent the ink from drying out. There is a lot of blue tape holding things down, so take your time and go through the printer thoroughly to remove it. Epson printers seem to have a lot of moving parts and they are all taped down. One thing you don't have to worry about is installing a print head. Compared to the Canon Pro 9500 Mark II, the R2000 is wider and taller but not as deep. It doesn't require much room, if any, in the rear, either, unlike the 9500/9000, which needs some space to feed fine art papers. Comparison. The Canon Pro9500 Mark II (left) and Epson R2000. We did miss the rollers on the back bottom of the Canon printers. The Epson has squat rubber feet. But the printer isn't as heavy as it looks so it wasn't a problem positioning it. It does seem to outweigh the Canons, though. We plugged the power cord in but that was it. We decided to try a WiFi connection since that's one of the attractions of the R2000. But we have to point out we have Wireless N here, the fastest breed. We wouldn't recommend this approach if your router is Wireless B or G.
Installing the inks wasn't difficult, although we remain mystified by the orange lights aligned by each cartridge. They were on when we opened the empty ink compartment and didn't change when we installed each cartridge. When we looked at them again, after our first print, they were all off. We didn't expect the basic user guide to explain that. The HTML user guide mentions the light flashes or stays on when a cartridge is low or empty. 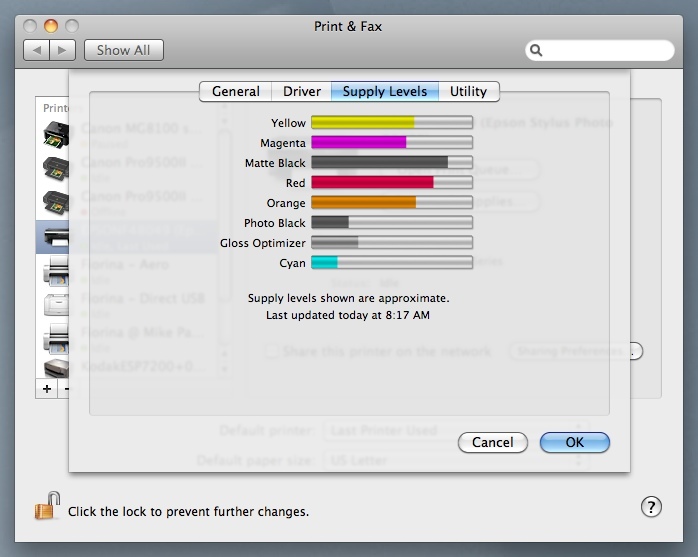 The HTML manual also recommends using the Printer Utility to monitor ink status. To install the cartridges, you press the Ink button, which moves the compartment to the right position. Never move the compartment by hand. Then you open the cover, pressing the gray latch toward you. Shake each cartridge a few seconds (they make a slight clicking sound), tear open the plastic package and remove the yellow tape only. There is a clear seal on the bottom that should remain there to prevent leaking. To insert the cartridge, just pop it in until it clicks. Removal requires just releasing the tab on the rear end of the cartridge. When all the cartridges have been installed, close the compartment cover and then the printer hood. Press the Ink button to charge the ink, which takes about three minutes. The Power light flashes during charging. That's all we had to do to install the hardware. Software was simple to install, too. We just inserted the CD, clicked all the options on and sat back and enjoyed the show. The installer copied profiles, drivers, documentation, a CD printing application and a test file to our system. It also set up the printer for our Wireless N connection. But it warned us to connect the printer with a USB cable. When we did that, it configured the printer to connect to our router and then told us how to install the printer on our operating system. Very smooth. You just need to know the name of your router and the password. We had an unusually large number of misprints (not to mention failed print commands) using the R2000 but it was entirely our own fault. 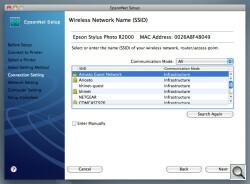 As we usually do, we worked with the R2000 from Mac OS X in Snow Leopard rather than Windows. While the issues are similar, the process is a bit different. The problem is that unlike many other printers, the R2000 has a variety of feeding options plus a large selection of compatible paper sizes and surfaces. You have to get all of those ducks in a row every time you print to get 1) a sheet to be printed and 2) the results you expect. Adding to the confusion is that there are multiple listings for Paper Size and both Paper Size and Source are expressed in a one-line description in the driver. And just to stir the pot, the option to print borderless (and whether to automatically enlarge to do it) are also in there. Saving a configuration didn't particularly help us keep all of these options aligned, either. You have more work to do if you let the printer manage the color, but we prefer to manage color in our image editing software. AccuPhoto HG. 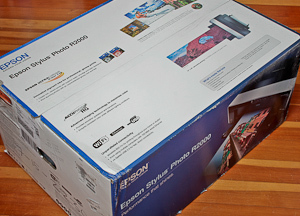 Epson's AccuPhoto HG image technology was created with the Rochester Institute of Technology's Munsell Color Science Laboratory. The HG stands for High Gloss. Using an advanced mathematical architecture and screening technology, it optimizes the use of each ink color to maximize color gamut, providing smoother color transitions and ensuring consistent color under different lighting, actually calculating the metameric index. Epson claims AccuPhoto HG can produce "truly photographic prints" even with high-speed and in lower resolution print modes. 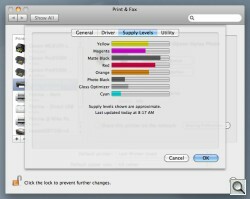 It isn't an option in the print driver, however, unless you let the printer manage color. We never do that, preferring to use an ICC profile in Photoshop for the ink and paper and manipulating color there. Automatic Ink Density Optimization. The R2000 agitates the inks periodically by shaking the print head back and forth to ensure consistent pigment density and color accuracy. You can do this manually from the Printer Utility, which advised that the process takes 30 seconds. Pigments need a little shake now and then to avoid settling in the ink vehicle and this agitation does that for you. Ink Set. Yes, it's an eight-color printer but let's do a little math here. Only one of the blacks will be printing (that's seven) and Gloss Optimizer isn't a color so much as a resin coating (that's six). Yellow, Cyan and Magenta are basic (although improved for gamut in this ink set), so we're really only looking at two additions to the basic four-color set: Red and Orange. Red we've seen before. It's a tough one to emulate, requiring equal dosages of magenta and yellow. 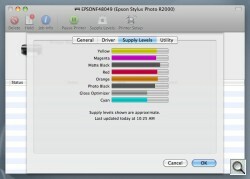 Epson has supplied a true red pigment, saving on magenta and yellow. It's usually paired with Green. But Orange? Epson claims it helps render true-to-life skin tones and browns. Epson told us Gloss Optimizer is not a clear coat but "a spackle for your prints." It's a special resin technology that coats each of the photographic inks except for Matte Black. Since those inks are already glossy, Gloss Optimizer only goes where they don't. It fills in the gaps on the sheet to guarantee the print is evenly glossy. And it has a very smooth glossy feel to it as well that makes it feel like a chemically processed print (minus the smell). We printed heavily edited images on a variety of media for several weeks. But the first thing we did was let the printer sit for a week. We wanted to know if it would clog. Rear Paper Feed. Just one option. We did seem to take an ink hit when we finally did turn it back on. After just four prints, we checked the ink usage and found it down about 15 percent. Which is pretty high usage. We also noticed that the printer is pretty energetic. Unlike other 13x19 printers we've tested, the R2000 really made our work table rock while it was charging the cartridges. When actually printing, it was much more subdued, however. Glossy Prints. We started with a couple of images we captured at the San Francisco Marathon. Both images printed perfectly the first time. We did make the mistake of selecting an 8x10 paper size in the printer driver for the letter sized sheet, but that only aligned the image on the page as if it were smaller. Premium Glossy. A letter size path in the foggy woods and an 11x14 angel. Luster Prints. We weren't as happy with our luster prints. They were muddy and lacked vibrance, a common complaint about pigment inks in comparison to dye inks. But by now we knew we were printing on letter-sized paper so they were positioned perfectly. Velvet Fine Art. Our preference lately has been to print on matte papers so we were anxious to try the Velvet Fine Art sheets. Until now, we'd been printing through the sheet feeder in the back. But Velvet Fine Art is a thick sheet. One side of it has been sized for inkjet printing, so you do have to make sure that's facing up as you load it. 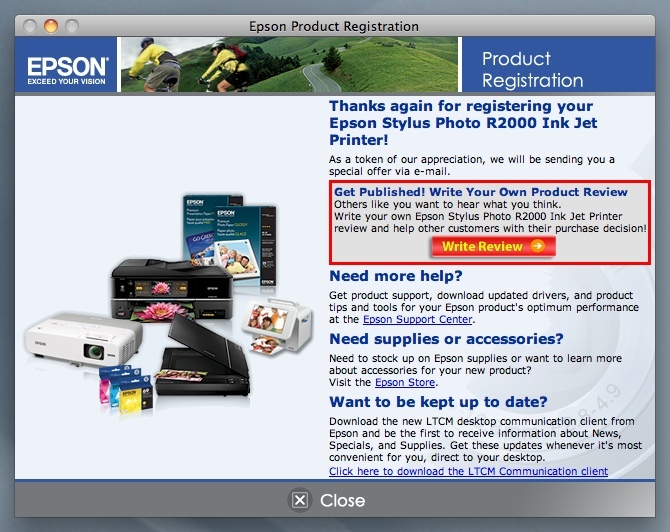 It's the whiter side, Epson says, but we found that hard to detect. Instead we used the Glossy paper orientation as a guide: the printing side faces up in the pack as you read the instructions. But where to load it? We were really puzzled. The spec sheet that accompanies the paper insists you load the sheet "in the manual feed slot only." There are two of these on the R2000. One is the single-sheet feeder you hook onto the back of the printer. The other is the front feed slot which also accommodates the CD tray. We stumbled around the driver trying to find a sheet size option that would let us also select Velvet Fine Art Paper. And we mistakenly thought we had to load it from the front (because it's thick). When we realized we could load it from the rear, we found the letter size rear manual feed option and all was well. Luster & Premium Glossy. A long dock at Lake Owasco, N.Y., some hydrangeas and two old framers. Feeding the paper into the rear manual feed slot is a bit tricky. Our tendency was to simply drop it in and go back to the computer to print. But no. You do drop it in but you have to push it down until you feel it stop and hold it there until the R2000 grabs it and pulls it in. That takes a few seconds while the R2000 thinks it over. 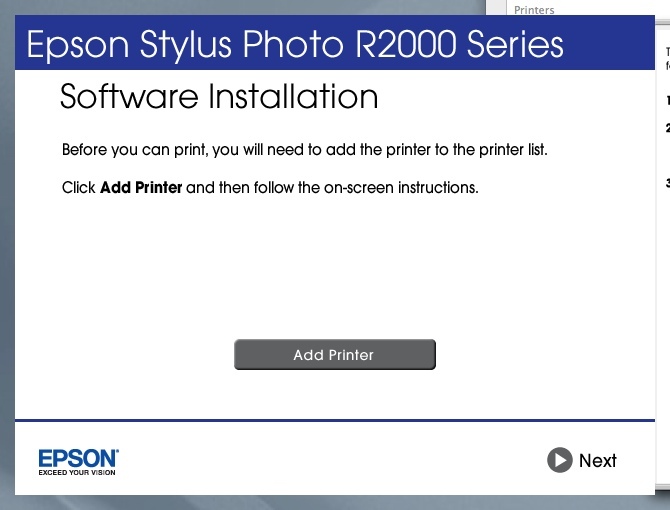 Fortunately Epson provides a set of videos that walk you through the fine art feed process at http://www.epson.com/support/R2000. We also tried a color image on Velvet Fine Art and again got an error message that the paper type and feed didn't match. We'd changed nothing at all except the image. Even after confirming we had the rear manual feed slot selected for Velvet Fine Art, we got the same error. Weird. Um, not so weird. We were out of paper. The rear slot only takes one sheet at a time, so you have to reload with every Print command. Roll Paper. 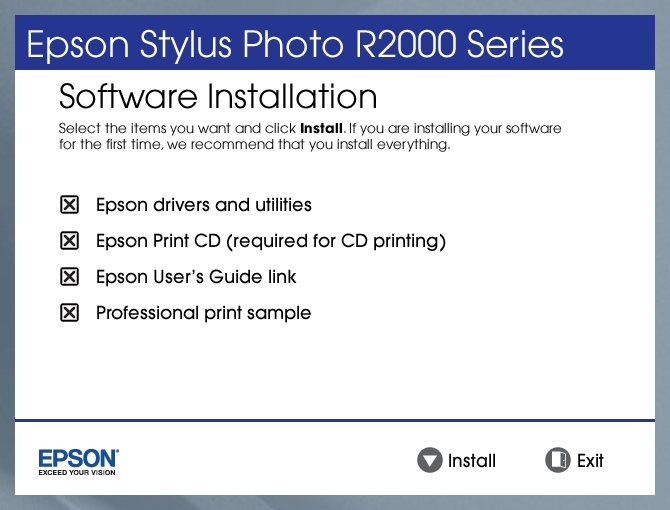 We had an old 4-inch roll of Epson Glossy Photo Paper but the R2000 documentation only mentions larger sizes. Roll paper, however, requires you to set up a custom paper size, so we wondered if we might not just try a couple panoramas on it anyway. We managed to load the paper using the roll ends, fitting the holders into slots obviously designed for the 4-inch rolls. Again, we had to push the front of the roll into the printer until it hit a stop and the R2000 grabbed it and pulled it in. 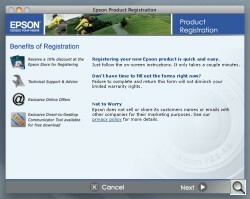 Epson videos on loading roll paper are at http://www.epson.com/support/R2000. Next we set up a custom paper size for the roll at 4x19 inches, the size of our Sony TX10 images. We made one change to our Print settings (telling the driver it was a roll) and off the R2000 went, printing our panorama. We had to feed the roll out a bit and grab a pair of scissors to cut off our panorama, but we had a nice 4x19-inch print of a Sony iSweep panorama of Bridalveil Falls in Yosemite. Emboldened by our success we tried another pano. But we got a feed error. It turns out you have to press the Roll button on the printer to retract the paper roll before it will print again. That saves you paper, so it isn't a bad thing. But you do have to be told about it. When you're done printing from the roll, you hold the Roll button in for three seconds and the R2000 rewinds the paper onto the roll so you can just lift it off. Very nice. 11x14. We'd taken a series of shots of the Angel of Grief on the Stanford campus and wanted to print them on 11x14 glossy. Epson had supplied its Premium Photo Paper Glossy in that size, so we loaded the normal paper feed with a few sheets, pulling out the extensions to support the large paper size. While our previous prints had been done from Photoshop, we did these from Lightroom, creating a custom user template for the 11x14 size. No problems. The prints were everything we'd hoped. In fact, when we laid a 10x magnifier over the highlights of our 11x14 print of a crop of a Micro Four Thirds image on Epson Premium Photo Glossy, we could barely detect the screen pattern. It looked a lot more like grain when viewed through a grain focuser at the enlarger. With the naked eye, it was impossible to detect. We had printed it at just 138 ppi, too, to fill the sheet. Disc Printing. 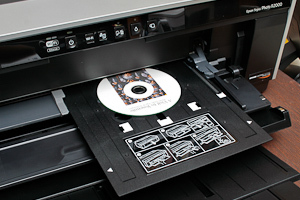 Epson provides a software application for printing on CDs called Print CD. It works with a number of Epson printers, so the first thing it does is collect information from your printer about its capabilities. Then it displays a CD outline in a window for you to decorate with a design along with a set of windows. CD Printing. Epson's CD printing application got the job done. 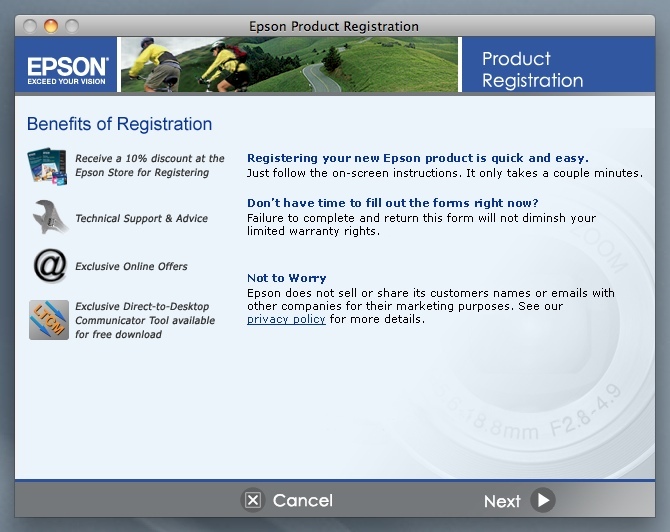 Along with the application, Epson supplies a large selection of backgrounds and clip art to use on your CD. The basic background area is 879x879 pixels, although some of the backgrounds are 1260x891. 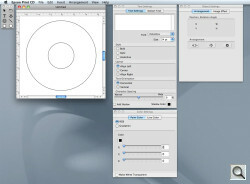 You can also use your own images, which will be scaled to fit the shortest dimension on the disc. 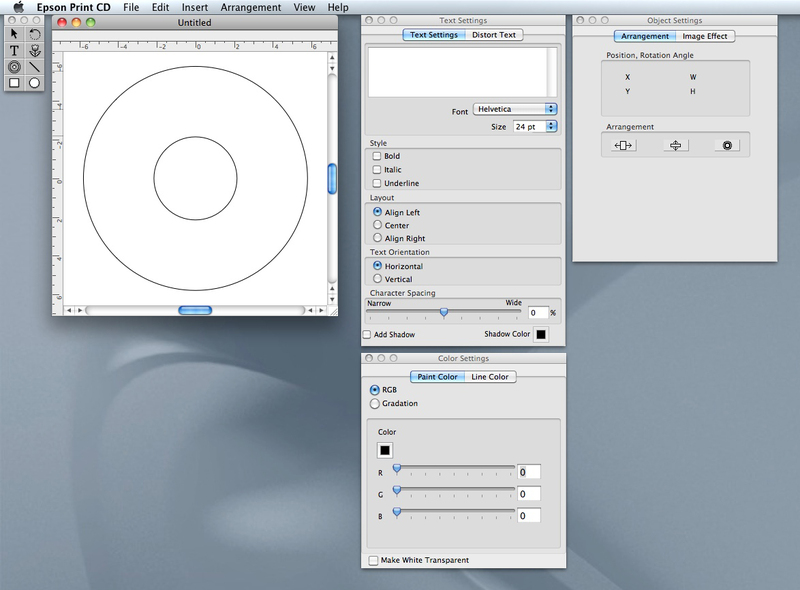 You can also scale the disc mask to the image, moving it around a larger image for a better crop. With a background placed on the layout, you can add text. 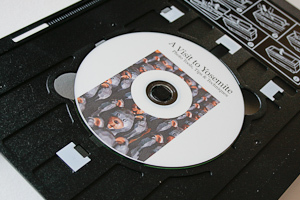 We just popped the PDF cover image of our book A Visit to Yosemite onto the CD and printed. Loading a CD is pretty straightforward. Just drop the printable CD blank onto the spindle in the holder. An adapter is included for smaller discs. Then open the front feeder door and slide the tray into the slot until the arrows on the front edge are aligned with the arrows on the tray itself. Simple. The Print dialog is complex but we didn't seem to need to do anything there, so we just hit print. And the CD quickly printed. It seemed dry by the time we touched it, too. So we burned it. 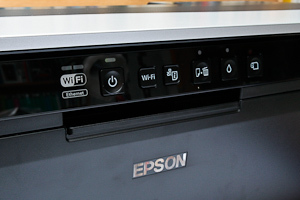 But Epson cautions that you may have to wait up to 24 hours for the ink to dry. Everything worked the first time and was simple enough to do. The results? We were pretty pleased. The type was sharp and the image clear. 13x19. 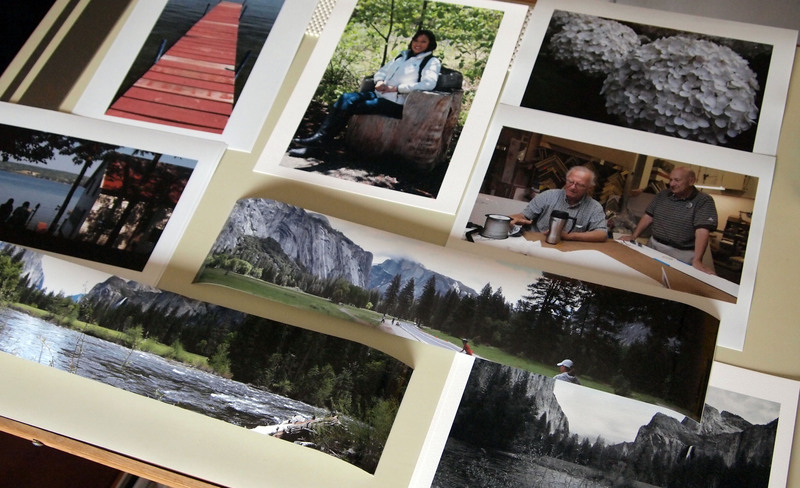 The real advantage of a 13x19 printer is to print 13x19 photos. And here the game ranges from glossy to fine art surfaces. Epson offers a healthy selection, although we only printed on Epson's Ultra Premium Photo Paper Luster finish. Our 12-Mp images are 4288x2848 pixels. At 240 pixels per inch, a rather generous allotment, they scale to 17.867x11.8676 inches, leaving a bit of a border on a 13x19 sheet. We don't usually print with that much data. And with AccuPhoto HG we presumably had even less of a reason to stay that high. But for our first bleed 13x19 we simply let the driver scale the image 105 percent. The results were quite pleasing. Images were crisp and color was faithful. A joy to behold, in fact. A big joy at 13x19, too. Black and White. Our first Velvet Fine Art print, a black and white conversion from color, was a bit too dark. Very heavily saturated with ink as well. We made a slight curves adjustment to lighten it and tried again. But with only one black ink, the R2000 uses color to enrich the tonality of the image. We detected both cyan and magenta at the edge of the image, so we suspect it's printing a quadtone. Still it seemed well balanced (neither cool nor warm). Black & White. Quadtones on the R2000. Finally, we printed a color image of some zebras as a black and white on Premium Glossy. The black and white print was noticeably cool, although the subtle tonal gradations were well preserved. That may have been the brighteners in the paper itself, however. We were impressed with the quadtone monocolor printing of the R2000, but we prefer to use multiple gray inks for that job. A permanent, hidden prejudice of ours, perhaps. Flesh Tones. The orange ink is tuned to flesh tones, so we gave that a shot, too. We printed an outdoor shot in full sunlight of three people of various ethnic backgrounds and we were just delighted with the results. The skin tones were all naturally rendered, well handled in the shadows as well as the highlights, from the ruddy complexion to the dark one. Then we printed another outdoor shot under an overcast sky, a profile of five sisters. The original image was captured by a Nikon S8000 at ISO 320. It was oversaturated, both the flesh tones and the greenery behind the subjects. We minimized that in Photoshop but printers tend to punch up color, so we were worried about it when we sent the image to the R2000. Flesh Tones. 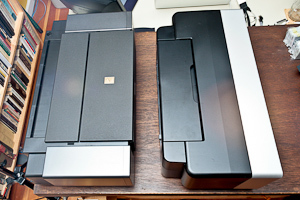 The 4x6s are Canon (right) and Epson. Pigment printers, on the other hand, are more subdued than their dye-based brethren. Not a great choice if you're work is sunsets. But the pigments did a great job on the sisters and the orange ink did indeed yield very smooth gradations of skin tone on the 11x14 print. Brave man, you might think, making a print of five women at once. If the color had not been stunning, you might not be reading this review right now. But, we wondered, was this noticeably better than what the Canon Pro9500 Mark II can do? To answer the question we reprinted a portrait of three women in restaurant light taken with an Oympus PEN E-PL1. It's a favorite of ours for its warm tones and vibrant skin tones. The Pro9500 uses a completely different palette of inks including a light gray, photo magenta, photo cyan, red and green, in addition to the usual four (CMYK). That, we thought, might penalize it when it came to these skin tones. But to our surprise the prints were indistinguishable from each other. And that despite the Canon print was on Kodak porous paper with a semi-gloss finish while the Epson print was on Premium Glossy. One of the long-standing problems with any inkjet, but particularly pigment inkjets, is clogging. We asked Epson about that. 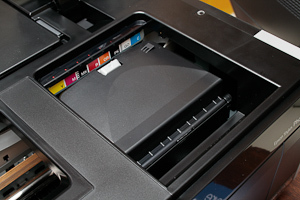 A large printer isn't going to get the frequent use of a smaller multifunction device. How would that affect clogging? Ink Usage Revisited. After quite a few more prints, you can see we've used a lot of cyan, photo black and the gloss optimizer, the latter two because we printed mainly on glossy and luster surfaces. They suggested two things. 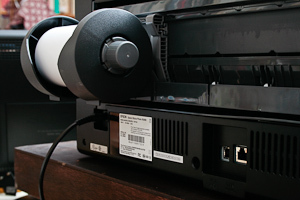 Turn the printer off when you're not using it, rather than just keeping the power on. That caps the print head in the home position, preventing it from drying out. Secondly, run the auto nozzle and head cleaning routine once a month or so. 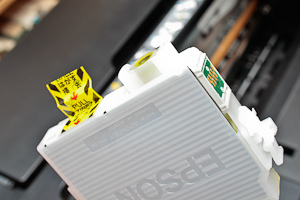 Epson recommends cleaning the R2000 several times a year to keep it working at its best. You should not use "a hard brush, benzine, alcohol or paint thinner to clean the product or you may damage it. Do not use oil or other lubricants inside the product or let water get inside it." The cleaning process is straightforward. Turn off the printer unplug any cables and remove any paper. Use a soft brush or dry microfiber cloth to clean the paper support and manual feed tray. 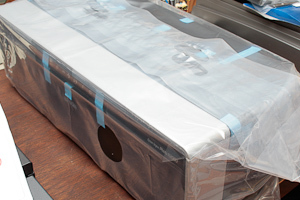 Close the paper support, manual feed tray, output tray and covers before cleaning the outer case with a soft cloth. Epson suggests dampening the cloth with mild detergent but only do it if necessary. Reconnect the power cable and turn on the printer. 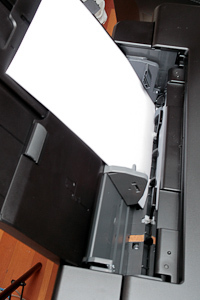 Load several sheets of plain paper in the sheet feeder to clean the rollers inside the printer. Epson sells Ink Jet Printer Cleaning Sheets to help remove dust from rollers, which can cause streaks on printouts from slippage, but try plain paper first. After loading the tray, just press the paper button several times to feed a few sheets through. You're done when the sheets come out clean. We enjoyed our sessions with the Epson Stylus Photo R2000. Even more, we enjoyed the prints it made. The R2000 brings a few unique capabilities to the party of 13x19 pigment printers. It's wireless, prints on roll paper and can handle disc printing. We found a use for all of those features. Like other medium-format pigment printers, it can handle a wide range of media from the typical glossy print to art papers. That versatility isn't a luxury on a printer designed for serious work. Our only quibbles with the R2000 were 1) its design, which seems a bit too delicate, and 2) the complexity of the driver. The design is something we've complained about before with Epson printers and have to admit hasn't actually been an issue (no failures). And the complexity is really complaining about a benefit, after all. The one black ink is not a formula for subtle black and white work. If you have a printer with several tones of gray or important shadow detail, a set of gray inks would do a better job than the quadtones of the R2000. But the flesh tones were very nicely rendered indeed if not significantly improved over the R2000's chief competitor, the Canon Pro9500 Mark II. Output was stunning, yes, but we've been stunned before. It's happy hunting if you're in the market for a 13x19 pigment printer. And in that market the Epson Stylus Photo R2000 merits our highest recommendation for color pigment printing. Images and text copyright © 2011 by The Imaging Resource unless otherwise noted.